A fine rare early Northwest Coast Nootka Nuu-chah-nulth hand carved and painted red cedar model totem dating from the early 1900's. The totem features wonderful imagery and features an Eagle, diving whale , wolf with his paws up, and a bear holding a seal. Expertly painted in all original old bold colors. The totem stands a respectable 16 3/4" tall x 2 1/4" x 2 1/3 at the base. Faint inscription on the back reads " Vancouver BC July 19__". 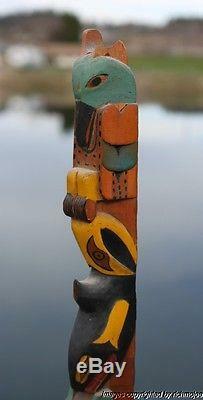 The totem makes an impressive display item and a fine addition to anyone's collection. Please check out other current offerings including a great Tlingit, Haida, Tsimshian and Kwakiutl totem poles, many historic baskets de-accessioned from museum collections including Salish, Haida , Tsimshian , Cowlitz and Tlingit examples. Also some great early Inuit carvings. More than just a pretty picture. FREE scheduling, supersized images and templates. Over 100,000,000 served. Get FREE counters from Vendio today! The item "FINE RARE OLD NORTHWEST COAST NOOTKA NUU-CHAH-NULTH INDIAN CEDAR TOTEM C1920" is in sale since Friday, March 18, 2016.